Height 5 ft 6 in. Weight 136 lbs. Chest 33-35 in. Complexion fair. Eyes grey. Hair brown. Eye sight, colour vision heart, lungs normal. Hearing good. Limbs, chest well formed. Full movement of joints. Teeth - false set of upper teeth, well fitting. Free from heernia, variocele, varicose veins, haemorrhoids, inveterate or contagious skin disease. Vaccinated. Good bodily & mental health. No physical defects. On Memorial wall, Timaru; Lovells Flat Memorial, Otago. Second son of Henry John & Catherine (nee KAVANAGH) PINK, of Caversham, Dunedin. Brothers Charles Clarence PINK & Harry Bartholomew PINK also served in WWI, Harry dying in 1922 from wounds inflicted. Attended Manuka Creek & Waitahuna Schools & Lawrence District High School. After leaving school he was in the Traffic Department of the Railways, but not wanting a transfer to Auckland he took employment in Timaru. Employed at the Dominion Hotel, Timaru. Hubert was one of many keen and determined applicants at the Drill Shed on 11 August 1914. He was not one of those rejected, mostly for defects to the teeth and one or two on account of height; he passed the medical exanimation and was sworn in. 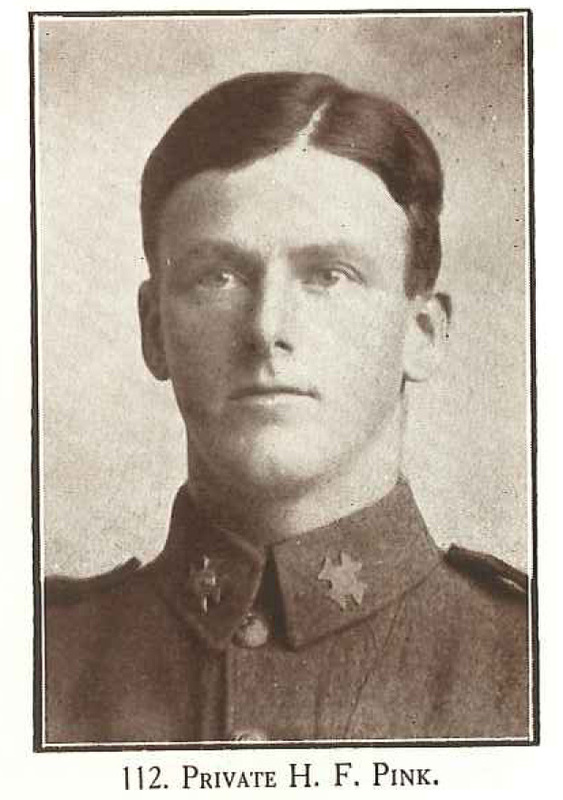 The successful applicants were liable to be called up at any moment, and it was quite probable that they would leave Timaru in a matter of days for the central camp at Christchurch as part of the 2nd South Canterbury Regiment's quota. . Good athlete & footballer. Cenotaph Database [19 November 2013]; NZ Defence Force Personnel Records (Archives NZ ref. AABK 18805 W5550 0093152) [20 November 2013]; CWGC [19 November 2013]; Timaru Herald, 12 August 1914, 24 May 1915, Press, 14 August 1914, 26 May 1915, Oamaru Mail, 27 May 1915, Otago Daily Times, 25 April 1919 (Papers Past) [18 November 2013, 19 November 2013, 22 November 2013, 02 December 2013]; Lovells Flat War Memorial image (ancestry.com.au) [02 December 2013].